This entry was posted in Gratitude, Writing and tagged 2012, Becky Green Aaronson, goals, happy new year, letters, new year's resolutions, writing by Becky Green Aaronson. Bookmark the permalink. This is so beautiful, Becky, and inspiring. Great idea. I love it! I can’t think of a better way to celebrate those you love. Thanks, Monica. I’m glad this resonated with you. Becky, your words and ideas always amaze me. You should be out there in print letting the world enjoy your uniqueness. Love your “niggling notion.” Mind if I cope your phrase one day? What an amazing idea, and you do it every year! I have a question . . . do you write the same 15 people each year, or 15 different people? I, too, am going to start my own list. And each time I sit to write, I’ll think of you and the special impact you’re making on this world. Happy New Year, Becky. May it be filled with good health, much love and uncommon success. Nancy, you are always filled with kind words. Thank you. And of course, borrow away!! I don’t actually do this every year. I did it one year, but it has stayed with me ever since. I’m glad this simple little idea has inspired you! Happy New Year to you! Truly a lovely idea. I feel it’s something I should undertake, but it’s a bit daunting. I’m glad to hear that it took you a whole year to do. I think I would start with my brother, too. Mental note to also add completing projects and fitness to my own 2012 year list, but I won’t hold my breath. Shimmer away. Susan, I’m glad you like this idea. I thought it was daunting too, at first, but I just started with one person, and soon several more letters followed. Happy 2012 to you! Shimmering!! When I was a teenager, I did the same thing for each family member. I still remember my sister, who has since passed away, leaning over my other sister’s shoulder (her twin, blind and disabled), reading the words I had written for each of them. There were tears. I don’t remember what I wrote, but I’ll never forget how moved I was by the writing and the giving of them. Thank you for reminding me of my own passion for sharing in this way. I’m going to do more of this in 2012, starting right now! Wow, Britton, doing that as a teenager says a lot about you. How wonderful that your sisters knew at an early age what they meant to you. I’m glad this post rekindled your joy of connecting in this way. Have a wonderful new year! I have a HS English teacher I never thanked and he needs a letter. As for being Oprah-ish, no, you’re being sincere as Oprah is when she’s at her best. I love that idea of exchanging letters instead of “things.” And I’m so happy for your HS English teacher. I can think of no better gift for a teacher than a letter of gratitude. Enjoy your project and have a wonderful year! I love that idea. I had someone close die in the past month and so your blog was particularly relevant for me. As always thanks Becky. And also Thanks soooo much for your generous support of my project. SO great. IT will go a long way in Africa. I’m glad this post resonated with you. So sorry for your loss. And you are welcome for our contribution to your bag project in Africa. We’re behind you all the way! I can’t wait to hear how your next trip goes in January! You are a great inspiration to many people! Bravo, Becky! Go on, be Oprah-ish. This works because it’s meaningful. I know who to write to. Thanks, Valerie. I love your enthusiasm! What a splendid idea, Becky. Thank you. I’ll do the same this year. That’s wonderful, Olga! You will never regret doing it, but may regret not doing it. Happy New Year to you. I hope the spirit of creativity continues to shine brightly for you in the new year! You are welcome, Nancy. I’m glad it resonated with you. Happy New Year! What a wonderful resolution, Becky! Not only will it be meaningful to the recipient, but it will also help remind the writer how that person has made a difference to her – particularly helpful when we lost sight of the fact over a disagreement, conflict, emotional wound, etc. It was definitely meaningful to me to be able to celebrate each person, and from the responses I received back, I could tell it was meaningful to each recipient to be told how much he or she was/is appreciated. I think you are right about healing emotional wounds too. It could be a very powerful too for that. There is no better goal that just that: making a difference in someone’s life! Agreed. Happy New Year Emily. I hope 2012 is filled with many meaningful moments! This is beautiful, Becky – I’m definitely a fan of writing gratitude letters! Best wishes to you and yours for a joyous new year full of much love, warmth, and well-being. Thank you, Tele. Happy New Year to you as well. Wishing you a year filled with all the things that make your heart sing. What a nice Idea Becky. I liked it a lot. There is nothing better than making a person feel, how much he/she means to that person. It’s something different but really a great thing to do. Wish you, Jeffrey & your family a very Happy & Prosperous New year. Happy New Year, Arindam! 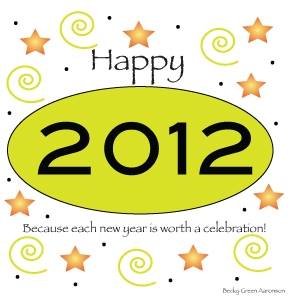 I hope 2012 is packed with many bright moments for you! What a fabulous idea to write to those you love. I think I’ll do the same. Happy New Year to you, Jeffrey and Olivia. When I wrote this post, I was concerned that it might sound a little too “Oprah-ish,” but I’m smiling big knowing it might inspire you to write to your loved ones. I’m sure they’ll be bowled over, especially with your gift of words. What a wonderful idea! I’m starting my list already. Yay! Happy New Year, Stu! I hope each day of 2012 shimmers with meaningful moments.